Growing up, I spent a lot of time outside running around as a little Heathen Child. My moccasin-clad feet carried me over a good square mile of terrain and I learned a lot about nature and plants just from being outside and observing. Norbert, the neighbor down the road, also taught me a lot about gardening and plants. Then there was the National Junior Horticultural Association where I competed in state and local competitions, earning awards for my plant knowledge. The love of plants is still going strong and the fact that I know a thing or two about how plants grow also helps to keep the landscaping costs down just a smidge. Willows are an interesting family of trees. The Native Americans, and other numerous ancient cultures, used the leaves and bark of willows for medicinal purposes. Salicin, the basis for aspirin, comes from willow. Willows also root readily from cuttings – you can just stick them in the ground where you want them to grow or put them in a glass of water, the roots will begin growing very quickly. Because they root so quickly they are perfect for erosion control along waterways. The subject of today’s image ended up in our yard the way quite a few plants have ended up in my yard: collecting. One day, years ago, I spotted a specimen of Salix matsudana and Mr. Muse and I really liked how it looked, so a six inch piece of that tree just happened to make it’s way to our house. Years later, that six inch piece is nearly six feet tall. Yesterday we had a warm front move through the area and the morning’s temperatures quickly rose to 50 degrees. Fog was in the air and moisture clung to the vegetation. Today’s image was just one of the results of my walk about the yard. My gear: Canon 30D fitted with a Sigma DC 18-200 mm 1:3.5-6.3 lens on loan from Jeff at JSV Experimental. 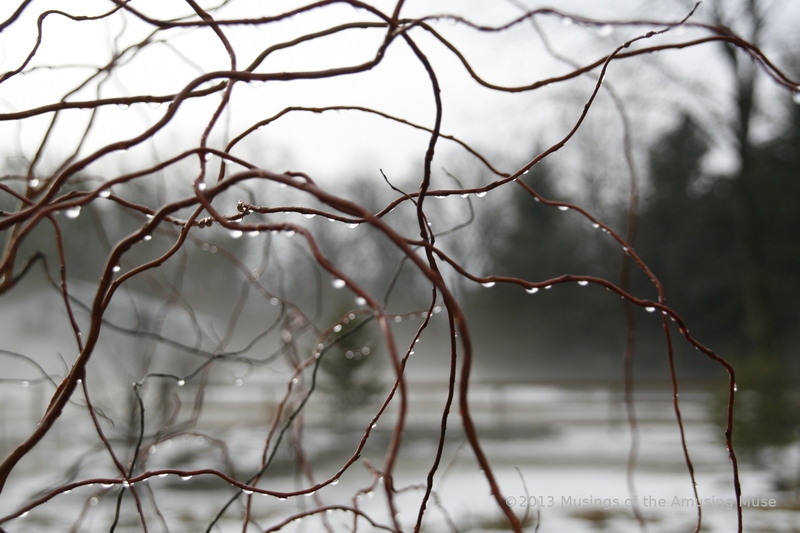 This entry was posted in Musings, Personal, Photography, Random Thoughts and tagged National Junior Horticultural Association, NJHA, Red Corkscrew Willow, Salix matsudana. Bookmark the permalink. Really like the picture but I’ll bet the yard looks totally different today! Wear your waders over your warm socks this morning! It DEFINITELY looks different. At least 4 inches of snow out there right now, and they say we’ll end up with 7 or 8 by the time it’s done. This is crazy nice, A.M!